"Norman Foster" redirects here. For other people of the same name, see Norman Foster (disambiguation). Norman Robert Foster, Baron Foster of Thames Bank, OM, RA (born 1 June 1935) is a British architect whose company, Foster + Partners, maintains an international design practice famous for high-tech architecture. He is the President of the Norman Foster Foundation. The Norman Foster Foundation promotes interdisciplinary thinking and research to help new generations of architects, designers and urbanists to anticipate the future. The foundation, which opened in June 2017, is based in Madrid and operates globally. He is one of Britain's most prolific architects of his generation. In 1999, he was awarded the Pritzker Architecture Prize, often referred to as the Nobel Prize of architecture. In 2009, Foster was awarded the Prince of Asturias Award in the Arts category. In 1994, he received the AIA gold medal . Norman Foster was born to Robert Foster and Lilian Smith in 1935 in Reddish, Stockport, Cheshire. They moved, soon after his birth, two miles to 4 Crescent Grove in Levenshulme, Manchester, where they lived in poverty: Foster has no recollection of Reddish. Foster's parents were diligent, hard workers – so diligent that Foster, as an only child, felt their heavy workload restricted his relationship with them and he was often looked after by neighbours or other family members. He attended Burnage Grammar School for Boys in Burnage. In a Guardian interview in 1999, Foster said he always felt 'different' at school and was bullied, he retired into the world of books. He considered himself quiet and awkward in his early years often making faux pas. Foster described Manchester as "one of the workshops of the world" and "the embodiment of a great city", his father, Robert, worked at Metropolitan-Vickers, Trafford Park which fuelled Foster's interest in engineering and design. He was fascinated with engineering and the process of designing. He says that caused him to pursue a career designing buildings. Specific interests included aircraft, a hobby he maintains today; and trains, generated by viewing passing trains on the railway outside his terraced home during his childhood. Foster's father convinced him to take the entrance exam for Manchester Town Hall's trainee scheme which he passed in 1951 and took a job as an office junior in the Treasurer's Department. A colleague, Mr Cobb's son, was studying architecture and his interest led to Foster considering a career in architecture. After working in the Manchester City Treasurer's office, Foster completed his National Service in 1953 serving in the Royal Air Force, a choice inspired by his passion for aircraft. Foster returned to Manchester, not wanting to return to the town hall as his parents wished and unsure of which path to follow. Foster was searching for a world away from his working-class roots which led to the alienation of his parents. Foster took a job as assistant to a contract manager with John Bearshaw and Partners, a local architectural practice. The staff advised him, that if he wished to become an architect, he should prepare a portfolio of drawings using the perspective and shop drawings from Bearshaw's practice as an example. Bearshaw was so impressed with the drawings that he promoted the young Foster to the drawing department of the practice. In 1956 Foster won a place at the University of Manchester School of Architecture and City Planning. Foster was not eligible for a maintenance grant so took up a number of part-time jobs to fund his studies, becoming an ice-cream salesman, night-club bouncer and working night shifts at a bakery to make crumpets. He combined these with self-tuition via visits to the local library in Levenshulme. Foster took a keen interest in the works of Frank Lloyd Wright, Ludwig Mies van der Rohe, Le Corbusier and Oscar Niemeyer and graduated from Manchester in 1961. Foster won the Henry Fellowship to the Yale School of Architecture, where he met future business partner Richard Rogers and earned his master's degree. Vincent Scully encouraged Foster and Rogers to travel in America for a year. After returning to the UK in 1963 he set up an architectural practice as Team 4 with Richard Rogers, Su Brumwell and the sisters Georgie and Wendy Cheesman. Georgie (later Wolton) was the only one of the team that had passed her RIBA exams allowing them to set up in practice on their own. Team 4 quickly earned a reputation for high-tech industrial design. After Team 4 went their separate ways, Foster and Wendy Cheesman founded Foster Associates in 1967, which became Foster and Partners in 1999. A long period of collaboration with American architect Richard Buckminster Fuller began in 1968 and continued until Fuller's death in 1983. They collaborated on several projects that became catalysts in the development of an environmentally sensitive approach to design – including the Samuel Beckett Theatre project. Originally they concentrated on industrial buildings. The turning point was the 1969 administrative and leisure center for Fred. Olsen Lines in London Docklands, where workers and managers are not separated any more. Foster and Partners' breakthrough building in the UK was the Willis Faber & Dumas headquarters in Ipswich, of 1974. The client was a family run insurance company which wanted to restore a sense of community to the workplace. Foster created open plan office floors long before open-plan became the norm. In a town not over-endowed with public facilities, the roof gardens, 25 metre swimming pool and gymnasium enhanced the quality of life for the company's 1200 employees. The building has a full-height glass façade moulded to the medieval street plan and contributes drama, subtly shifting from opaque, reflective black to a glowing backlit transparency as the sun sets. 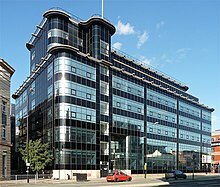 The design was inspired by the Daily Express Building in Manchester a work Foster admired in his youth. The building is now Grade I* listed. The Sainsbury Centre for Visual Arts, an art gallery and museum on the campus of the University of East Anglia, Norwich, was one of the first major public buildings to be designed by Foster, completed in 1978, and became grade II* listed in December 2012. In 1990 Foster's design for the Terminal Building at London Stansted Airport was awarded the European Union Prize for Contemporary Architecture / Mies van der Rohe Award. View of 30 St Mary Axe. The building serves as the London headquarters for Swiss Re and is informally known as 'The Gherkin'. Foster gained a reputation for designing office buildings. 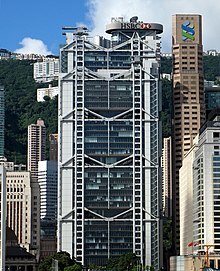 In the 1980s he designed the HSBC Main Building in Hong Kong for HSBC. The building is marked by its high level of light transparency, as all 3500 workers have a view to Victoria Peak or Victoria Harbour. Foster said that if the firm had not won the contract it would probably have been bankrupted. Foster believes that attracting young talent is essential, and is proud that the average age of people working for Foster and Partners is 32, just like it was in 1967. Foster was assigned the brief for a development on the site of the Baltic Exchange in the 1990s. The Exchange was damaged beyond repair by a bomb left by the IRA. Foster + Partners submitted a plan for a 385 metre tall skyscraper, the London Millennium Tower, but its height was seen as excessive for London's skyline. The proposal was scrapped and instead Foster proposed 30 St Mary Axe, popularly referred to as "the gherkin", after its shape. Foster worked with engineers to integrate complex computer systems with the most basic physical laws, such as convection. The restored Reichstag in Berlin, housing the German parliament. The dome is part of Foster's redesign. Foster's earlier designs reflected a sophisticated, machine-influenced high-tech vision. His style has evolved into a more sharp-edged modernity. In 2004, Foster designed the tallest bridge in the world, the Millau Viaduct in Southern France, with the Millau Mayor Jacques Godfrain stating; "The architect, Norman Foster, gave us a model of art." Foster worked with Steve Jobs from about 2009 until Jobs' death to design the Apple offices, Apple Campus 2 now called Apple Park, in Cupertino, California. Apple's board and staff continued to work with Foster as the design was completed and the construction in progress. The circular building was opened to employees in April 2017, six years after Jobs died in 2011. In January 2007, the Sunday Times reported that Foster had called in Catalyst, a corporate finance house, to find buyers for Foster + Partners. Foster does not intend to retire, but sell his 80–90% holding in the company valued at £300M to £500M. In 2007, he worked with Philippe Starck and Sir Richard Branson of the Virgin Group for the Virgin Galactic plans. Foster currently sits on the Board of Trustees at architectural charity Article 25 who design, construct and manage innovative, safe, sustainable buildings in some of the most inhospitable and unstable regions of the world. He has also been on the Board of Trustees of the Architecture Foundation. In 2012, Foster was among the British cultural icons selected by artist Sir Peter Blake to appear in a new version of his most famous artwork – the Beatles' Sgt. Pepper's Lonely Hearts Club Band album cover – to celebrate the British cultural figures of his life that he most admires. Foster was made a Knight Bachelor (Kt) in the 1990 Birthday Honours, and thereby granted the title sir. He was appointed to the Order of Merit (OM) in 1997. In the 1999 Birthday Honours, Foster's elevation to the peerage was announced in June 1999 and was raised to the peerage as Baron Foster of Thames Bank, of Reddish in the County of Greater Manchester in July. Foster was elected an Associate of the Royal Academy (ARA) on 19 May 1983, and a Royal Academician (RA) on 26 June 1991. In 1995, he was elected an Honorary Fellow of the Royal Academy of Engineering (HonFREng). On 24 April 2017, he was given the Freedom of the City of London. The Bloomberg London building received a Stirling Prize in October, 2018. Foster received The Lynn S. Beedle Lifetime Achievement Award from the Council on Tall Buildings and Urban Habitat in 2007 to honour his contributions to the advancement of tall buildings. He was awarded the Aga Khan Award for Architecture, for the University of Technology Petronas in Malaysia, and in 2008 he was granted an honorary degree from the Dundee School of Architecture at the University of Dundee. In 2009 he received the Prince of Asturias Award in the category Arts. ^ Goldberger, Paul (28 May 1988). "Architecture View; What Pritzker Winners Tell Us About the Prize". The New York Times. ^ a b Sudjic 2010, p. 11. ^ Moore, Rowan (23 May 2010). "Norman Foster: A Life in Architecture by Deyan Sudjic". The Observer. London. Retrieved 6 October 2011. ^ Sudjic 2010, p. 19. ^ a b c d e "The Guardian Profile: Sir Norman Foster: The master builder". The Guardian. London. 2 January 1999. Retrieved 6 October 2011. ^ "Book review: Norman Foster: A Life in Architecture". scotsman.com. 13 June 2010. Retrieved 6 October 2011. ^ Sudjic 2010, p. 32. ^ a b c "Taller, higher, bigger, Foster". The Guardian. London. 24 October 2005. Retrieved 5 October 2011. ^ a b Sudjic 2010, p. 27. ^ "Lord Norman Foster Biography and Interview". www.achievement.org. American Academy of Achievement. ^ Sudjic 2010, p. 30. ^ Sudjic 2010, p. 34. ^ Sudjic 2010, p. 35. ^ Sudjic 2010, p. 37. ^ Sudjic 2010, p. 36. ^ Sudjic 2010, p. 39. ^ Sudjic 2010, p. 40. ^ a b "Norman Foster: Building the future". BBC News. 9 May 2000. Retrieved 5 October 2011. ^ Thistlethwaite, Laura (30 October 2008). "Architect's Levenshulme inpsiration [sic]". Manchester Evening News. M.E.N. Media. Retrieved 5 October 2011. ^ a b c How much does your building weigh, Mr. Foster?, Sternstunde Kultur, Schweizer Fernsehen, 4 December 2011. ^ "Samuel Brackett Theatre – The Project". Foster + Partners. ^ "Lord Norman Foster portrait". The Daily Telegraph. London: Telegraph Media Group. 24 June 2008. Retrieved 1 October 2011. ^ Treiber, Daniel (1995). Norman Foster. E & FN Spon. p. 76. ^ "London Millennium Tower". Emporis. Retrieved 10 October 2011. ^ "France shows off tallest bridge". BBC News. 14 December 2004. Retrieved 1 October 2011. ^ a b Levy, Steven (16 May 2017). "One More Thing: Inside Apple's Insanely Great (or Just Insane) New Mothership". Wired. Retrieved 1 July 2017. ^ "Why Steve Jobs Tapped Norman Foster to Design Apple's Future HQ". Bloomberg News. 4 April 2013. Retrieved 1 July 2017. ^ Hamilton, Fiona (21 January 2007). "Foster puts £500m firm up for sale". The Times. London. ^ "Sir Peter Blake's new Beatles' Sgt Pepper's album cover". BBC News. 8 November 2016. ^ "No. 52173". The London Gazette. 15 June 1990. p. 2. ^ "No. 55513". The London Gazette (Supplement). 12 June 1999. p. 1. ^ "No. 55565". The London Gazette. 28 July 1999. p. 8128. ^ "No. 24643". The Edinburgh Gazette. 23 July 1999. p. 1551. 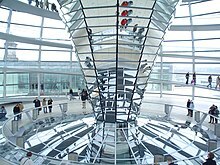 ^ "Norman Foster RA". Royal Academy of Arts. Retrieved 17 November 2018. ^ "List of Fellows - Foster". Royal Academy of Engineering. Retrieved 17 November 2018. ^ Wainwright, Oliver (10 October 2018). "Norman Foster's Bloomberg office in London wins Stirling prize". the Guardian. Retrieved 11 October 2018. ^ "2007 Lynn S. Beedle Award Winner". Council on Tall Buildings and Urban Habitat. Retrieved 17 May 2012. ^ "The Tenth Award Cycle 2005–2007". The Aga Khan Development Network. Retrieved 21 January 2009. ^ "Petronas University of Technology receives 2007 Aga Khan Award for Architecture". Foster + Partners. 9 April 2007. Archived from the original on 9 April 2009. Retrieved 21 January 2009.